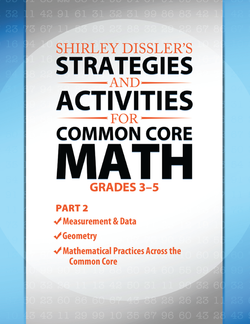 This comprehensive program by Dr. Shirley Disseler contains strategies and activities to teach your grade 3 - 5 students to master Common Core Mathematics Standards. Your students will develop a solid understanding of math concepts, procedural skill and fluency, and be able to apply math in their everyday lives. Each chapter has dozens of new activities that teachers can use to align their math instruction with the Common Core Standards for Mathematics. All the activities include the step-by-step procedure for teaching, along with game boards, activity cards, recording sheets, and assessment materials. The complete program (Parts 1 and 2) gives strategies and activities for teaching every Common Core Standard for Mathematics in grades 3 - 5.